Okay, you are religious, or at least, spiritual. But you also enjoy all the benefits of science. So how can you live with both at the same time? This book spells out a coherent worldview that can help you be real in the twenty-first century. Rather than try to reconcile religion and science--the two, competing worldviews that dominate our American consciousness--the author tracks a path between them, embracing the unique contributions of each while avoiding the shortcomings of both. In the end, it clarifies what we must do to have the light and warmth we all need and be fully human. those who are as fanatical about their secularism, or scientism as the worst of religious zealots. Robinson covers such diverse subjects as angels, quantum physics, religious and scientific arrogance, the Death of God, sentimentalism, tests for truth, dogma, bizarre spirituality, the process of secularization, idolatry and worship, science run amok, faith and reason, and ethics. He says you do not need an advanced degree to discern his "middle way," but he does ask you to think. STOP! Not for the closed-minded or fainthearted. Here is a pull-no-punches poke at both supernatural religion and arrogant science run amok. "With Intellectual integrity, balance and liberating power, Duke Robinson paves a no-nonsense, solid, middle road between science and religion." 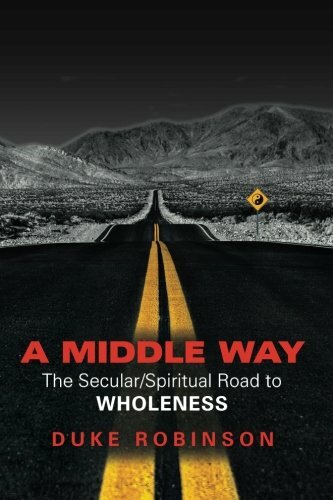 "In the author's middle way between science and religion lies the path to liberated spiritual development: "to live with worthwhile purpose and to have your most noble thoughts direct your behavior." This is Robinson's travel guide along the path. Always avoiding superficial answers, he focuses on asking all the right questions, with the goal of leading each reader to a fulfilling personal and individual style of Secular Spirituality." "When religion and science fail to provide the warmth and light we all need, this book offers an edifying guide to a richer, spirit-driven life. The author impressively appraises the world's major religions, philosophical belief systems and Western science--all of which, he shows, fail to promote realistically the unique possibilities of human consciousness. He then builds a convincing case for Secular Spirituality, his road to wholeness based on the truths uncovered by science and the reality of a spiritual power at the heart of every person." "The world in which the great religions arose was geocentric, pre-science and mythical. The last 500 years of secularization changed this environment dramatically. Responses to this change have ranged from a desperate clinging to past religious formulations to a total rejection of them. Robinson boldly advocates a middle road that affirms both what has changed and what is of value from the past. Whether or not you agree with his conclusions you will find this book a stimulating journey! Paul H. Gertmenian, CEO, Henry Gertmenian Co. In 2000, Time Warner published the paperback version of Duke Robinson's award-winning hardcover book GOOD INTENTIONS, under the title TOO NICE FOR YOUR OWN GOOD: How to Stop Making 9 Self-Sabotaging Mistakes. It appeared in 13 languages and as an early Kindle book. It continues to sell briskly. His second non-fiction book, CREATE YOUR BEST LIFE: How to Live Fully Knowing One Day You Will Die, appeared in December 2011, published through CreateSpace. In September 2012, he published his first novel, SAVIOR: An Old Notion in a New Novel of Unthinkable Absurdity, also through CreateSpace. Robinson was reared in the Philadelphia area, graduating in 1950 from Haverford High School. He holds a BA degree in philosophy (1954) from the Wheaton College near Chicago, and a Masters of Divinity degree (1958), from Louisville Presbyterian Theological Seminary. He has lived since 1960,in the East Bay of Northern California. For 28 years before retiring , Robinson led the dynamic, progressive Montclair Presbyterian Church in Oakland. For several years during that ministry he also served part-time as an adjunct professor at San Francisco Theological Seminary, from which he holds an earned doctorate (1979). He also was known widely as a speaker and appeared frequently on Northern California television. Since 2000, he has lived in Rossmoor, an adult community in Walnut Creek, CA, 30 miles east of San Francisco. Barbara, his beloved wife of 54 years died in 2008 In this book, he writes intimately of her dying, and of his almost dying in 2009. He has four children, nine wonderful grandchildren and two great grandsons who, he says, are geniuses. This book, his third non-fiction work, published in May 2014, won the Honorable Mention Award in the Writers Digest contest for that year. In November 2015, Big Hat Press in Lafayette, CA, published his fifth book, a memoir, STANDING ON MY HEAD ... WITH MY FLY OPEN. Robinson stood on his head when he was eight. He plans to hit 85 in January 2018.